@OtherRandomBlackGuy, Finn: But what about level 80? Jake: you stay away from that!, do not do level 80! I find it interesting that all the first four are labeled "hand grip" and level 70 is just like: "God's hand"
@FriendlyWalrus, all hail lord gorilla, rustler if jimmies! This is the third time,(at least), this has been retoasted. I think it's burnt. 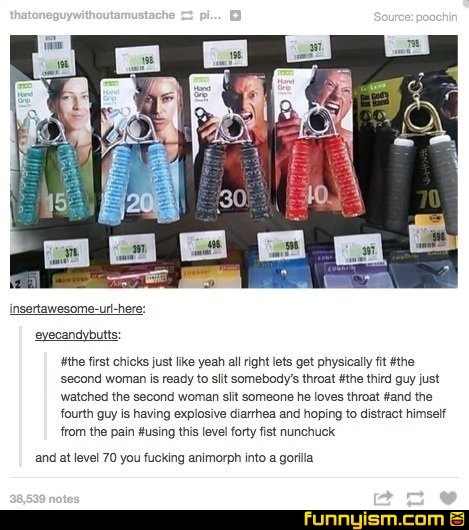 @Childish Gambeaner, We always need to remind everyone that if you hit level 70, you get to evolve into a gorilla! @Sylux, maybe we can retoast it 70 times, so not only is it carbonized remains, but also we can evolce into gorillas! Most people have a greater grip strength than 70. I have one of these that requires 175 lbs to close and it's difficult but I can do it. Not trying to brag but it's not too hard.